This tiny workstation from HP has been built to meet the modern demands of the creative industries. Measuring shorter than a cup of espresso, the HP Z2 Mini Workstation is the first workstation of its kind. Designed for users in CAD and other compute-intensive industries, the HP Z2 Mini Workstation is a compact yet powerful piece of hardware suited to the space-saving needs of modern workplaces. Straight out of the box, the HP Z2 Mini Workstation is capable of supporting six displays, perfect for busy art directors switching between project details. Thanks to its diminutive size, the octagonal workstation is easy to incorporate into small workspaces, and with a custom designed fan it's also quieter that an HP business-class mini PC. In terms of hardware, the mini workstation comes equipped with next generation Intel® Xeon® processors, NVIDIA® professional graphics and the availability of HP Z Turbo Drive for handling large files remarkably fast. 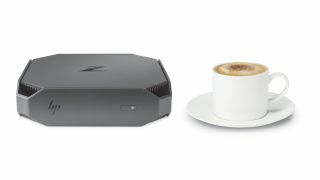 “The HP Z2 Mini, the world’s first mini workstation, delivers breakthrough power and versatility in a small, iconic design,” said Gwen Coble, director, Workstations, Thin Clients, Retail Solutions and Immersive Computing, EMEA, HP Inc. The HP Z2 Mini Workstation is expected to be released in the UK in December, with prices starting at approximately £750.